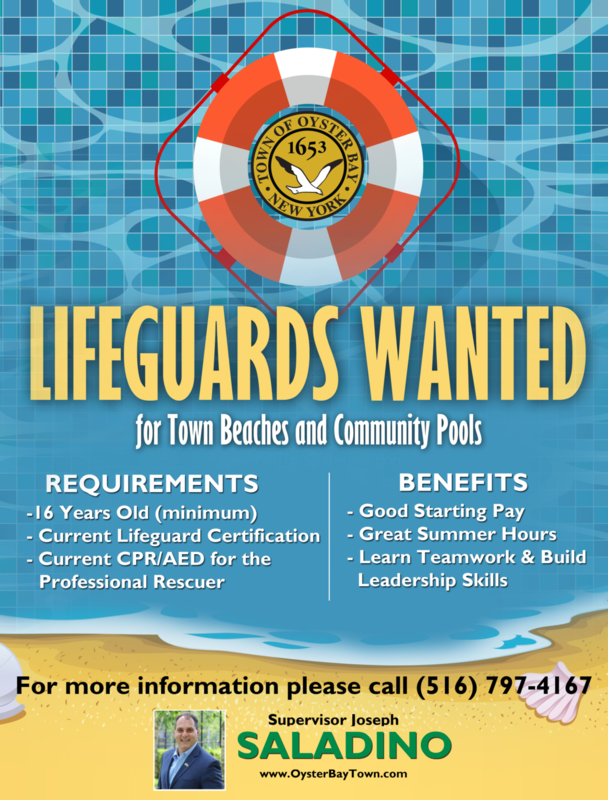 Town of Oyster Bay Supervisor Joseph Saladino and Councilman Lou Imbroto announce that the Town is accepting applications from qualified, certified individuals interested in working at Town pools and/or beaches this upcoming summer season. Town lifeguards are hired for the summer season, which runs from Memorial Day through Labor Day. Positions are available at all Town pools and beaches. Applicants must be a minimum of 16 years old, possess a current Lifeguard Certification and a current CPR/AED for the Professional Rescuer. Qualified applicants may apply in person at the Town of Oyster Bay Parks Department Human Resources Office, located in Town Hall South, 977 Hicksville Road, Massapequa, NY. For more information, please contact the Parks Department at (516) 797-7958.